This is a truly stunning section of track. You climb out of the sheltered, rather drab Combe de Prafleuri before the sun is too high in the sky, then drop through a section of high alpine meadow to the shores of the vast Lac des Dix, which you walk alongside. A short ascent at the southerly end of the lake allows you to enter an entirely different landscape. The green pastures are replaced by a broad glacier-gouged valley lined with piles of moraine. The glacier itself has retreated, leaving behind a highly distinctive background to the rest of the day's walk. Climbing along the moraine ridge, the path crosses the Tï¿½te Noir before descending to Cabane des Dix, set in an extraordinary location atop a plug of rock adjacent to the Glacier de Cheilon, in the lee of the imposing north face of Mont Blanc de Cheilon. From here the path descends to the glacier and then crosses it before ascending the cliff on the far side of this frozen river via Col de Riedmatten or the fixed ladders at Pas de Chï¿½vres. The final section is a gentle descent to the hamlet of Arolla, beneath the distinctive Pigne dï¿½Arolla. For those who want to take a slightly shorter route (see p197 of book), there is a shortcut between the end of Lac des Dix and Col de Riedmatten or Pas de Chï¿½vres that avoids going to Cabane des Dix. In bad weather or if there is a lot of fresh snow lying on the Glacier de Cheilon, thereby making a crossing of it more hazardous, this is a sensible option. Otherwise, it would be a shame to miss the Cabane and the dramatic surrounding views which are amongst the highlights of the entire trek. The section begins with a short ascent from Cabane de Prafleuri. From the hut the path heads up into the basin briefly then bears left (south-west) to loop round to a point below a ridge where there is a clearly visible pass 180m/590ft above you. Having negotiated a small boulder field, the path zigzags tightly up the slope, gaining height quickly and simply. Thirty minutes after leaving the hut, you gain Col des Roux (2804m/9200ft) where, if you set out early enough, the rising sun awaits you. Also awaiting you are surprising views of Lac des Dix and the rather robust Aiguilles Rouges dï¿½Arolla that line its easterly shore. Having soaked up the sun and the change in scenery, pick up the path that crosses straight over and begins to descend first through a tumble of rocks and then through high Alpine pasture, dotted with gentians and other flowers. Ducking away from the lake briefly, the path heads up-valley towards the Glacier des Ecoulaies which blankets the upper reaches of the basin before turning hard left (east) just after a small, lone hut to begin heading back on itself. The path crosses a small stream and continues to descend gently before veering right (south) and contouring across two further streams on small wooden bridges until, 45 minutes from Col des Roux, you reach the solid Refuge de la Gentiane La Barma (no telephone but contact Cafe de Amis in Hï¿½rï¿½mence on tel 027-281 1197 to make a reservation; dorm CHF14). Dating from 1934, these former cowsheds were converted into a hut and bunk rooms in the mid 1960s. Now run by the gymnastic society La Gentiane, it is occasionally manned during summer and is always at least partly open. Set on a picturesque green slope above Lac des Dix, it's a great place to stay and a very good alternative to Cabane de Prafleuri. Self-catering facilities are available in addition to running water, a wood stove and solar-powered lighting and there are bunks for around 30 people. From the refuge the path drops 30m/100ft across a grassy pasture to the lakeside where it joins a broad track originating from the Barrage de la Dixence, turns right (south) and contours south alongside the lake beneath the hanging glaciers of Rosablanche and its neighbouring peaks and opposite the crags of Aiguilles Rouges dï¿½Arolla. Walk evenly for an hour along the track towards the head of the valley amidst pastures grazed by cows and marmots. 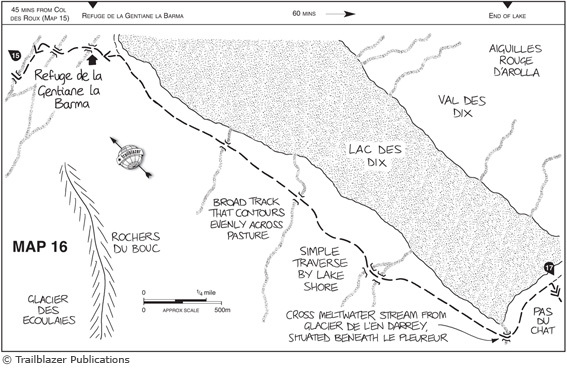 At the south-west corner of the lake, the path crosses a glacial river fed by the melting snows of the Glacier de lï¿½En Darrey, situated beneath Le Pleureur (3703m/12,145ft), before curving sharply left (east) and tracking across the end of the lake. Just before the south-eastern corner of the lake, at Pas du Chat, a path leaves the main track, heading right (south) and climbing steeply up a grassy slope. Very quickly the path comes to a junction; for Cabane des Dix continue climbing straight ahead (south-east), zigzagging through the tussocks and grasslands, but if you want to save time off the day's trek or bypass Cabane des Dix, follow the alternative route described on page 197 of the book. Following the junction, the path to Cabane des Dix follows a series of tight zigzags, gaining height quickly. Rounding a small bluff the path edges onto the lateral moraine to the west of the Glacier de Cheilon and climbs to the ridge, which it follows south, high above the valley floor. From this vantage point the views are extraordinary, with the path of the glacier leading your eye towards the head of the valley. The most extraordinary sight, though, is a brief glimpse of the Matterhorn from the moraine ridge through a chink in the sheer wall on the opposite side of the valley. There are only a handful of places from where the peak is visible on its own in all its shark-toothed drama, free from other mountains or distracting peaks. A few steps further and the tantalizing vision is lost. The path continues to push on along the moraine towards the dark mass of the Tï¿½te Noir (2981m/9780ft), whose rocky promontory appears to block the way ahead. At a point almost exactly opposite Col de Riedmatten and Pas de Chï¿½vres the path bears right (south-west), drops off the moraine ridge and then starts to ascend the flank of the Tï¿½te Noir steeply on a narrow scree path. The views back down the valley towards Lac des Dix are striking but do not compare with the panorama that opens before you as you gain the shoulder of the small peak. From this vantage point there are breathtaking views of the intimidating north face of Mont Blanc de Cheilon (3869m/12690ft), which dominates the view south and from whose sides sweeps the broad glacier responsible for gouging the valley below. To the right (west) are the snow fields of La Luette (3548m/11,637ft). Closer, at the foot of the descent from the saddle there is the rocky plug on top of which stands Cabane des Dix. Scrambling left (east) from the saddle brings you to the top of the Tï¿½te Noir, on which stands a large black cross, from where some of the finest panoramas can be enjoyed. Turning to look east from here, across the glacier and beyond the wall on its far side, there are views of a row of spectacular peaks beyond Arolla, dwarfed amongst which is the distant Matterhorn. From the shoulder of the Tï¿½te Noir the path drops down a scree slope to the flatter floor of a small ledge above the glacier, where it crosses two small streams on wooden boards and approaches the rocky mound, atop of which Cabane des Dix (2928m/9604ft) perches precariously. By climbing stiffly up this hummock, you reach the hut after 41/4hrs. Cabane des Dix (tel 027-281 1523, www.cabanedesdix.ch, dorm half board CHF65) is named after a gang of ten thieves who hunted and lived in caves in the area, occasionally descending to pillage nearby towns. Eventually the gang were driven out by outraged villagers fed up with them stealing food from their homesteads. The hut was first built in 1908 from wood but was then taken down and moved slightly in 1928 before being rebuilt out of local stone. Nowadays it is owned by the Monte Rosa section of the Swiss Alpine Club. Staffed from early March until mid May and then from mid June to late September, it is one of the most popular places so reservations in high season are essential. However, sections of the hut are left unlocked during the low season. Large, with capacity for 125 people, it is nonetheless friendly and welcoming and there is frequently a lively atmosphere on the terrace where walkers, climbers and ski-mountaineers mingle. From the Cabane, the path drops cautiously to the edge of the Glacier de Cheilon. There is no actual path across the glacier but the hut guardian is very areful to maintain a series of stick crosses that indicate the route. From the side of the glacier pick out the route heading north-west across the glacier before you start. Follow the crosses closely, sticking to the trail. Boulders and chunks of ice dot the surface of the glacier but there are no crevasses of note on this section and the 20- to 30-minute crossing ought to be fairly straightforward. The views back south of the peaks at the head of the glacier are especially striking from down on the ice. On the far side of the glacier is a further mass of moraine and debris. The path turns left (north-north-east) and climbs amongst this, picking its way past rust-coloured rocks and shattered, sandy stones. A series of short switchbacks brings the path to a direct track from Lac des Dix. Shortly after this the path forks, with the left-hand path scrambling higher, following red-daubed waymarks to join up with the alternative path from Pas du Chat and ascend a broken gully to the narrow cleft in the almost sheer wall that is Col de Riedmatten (2919m/9574ft), whose channel-like sides act as blinkers and hide the views beyond until you emerge on the Arolla side of the pass. The right-hand fork contours briefly, hugging the wall on a narrow ledge. Red hand-painted signs indicate the way to Pas de Chï¿½vres, which is ascended on a series of ladders. Three metal ladders are securely attached to the rock face, although they are virtually vertical. Take care when ascending them with a full pack. The first ladder is reasonably long but joins the second relatively smoothly. In one or two places the rungs are so close to the cliff that there is only room for the toe of your boot to be jammed in place. The second ladder is the longest. At the top of this you must step off the ladder, on to a small ledge, before climbing the short final section of ladder to crest Pas de Chï¿½vres (2855m/9365ft). Whichever approach you use to climb the wall, the views from the top are awesome, with the massive cliffs beyond Arolla dominating the horizon and the summits of Dent Blanche and the Matterhorn amongst others visible far beyond. Beyond Col de Riedmatten the path drops into a gully and is channelled east before turning sharp right (south-east) and dropping south, where it is joined from the right by the path from Pas de Chï¿½vres. This has descended steeply from the top of the ladders into a rocky basin and then eased across a patch of scrubby grassland to meet the other path. Together they continue gently downhill, heading almost due east. To the right (south) stands the dominant, snow-clad Pigne dï¿½Arolla (3790m/12,431ft) and the heavily crevassed upper reaches of the Tsijiore Nouve Glacier issuing from beneath the mountain's north face, whilst to the south-east is the square bulk of Mont Collon (3637m/11,929ft) with its taller neighbour, the elegant snow and rock peak Lï¿½Evï¿½que (3716m/12,189ft), listing to its right. The path descends for 45 minutes, forking occasionally, although each junction is clearly signposted. Follow the signs for Arolla as the path enters a small patch of forest and 1-11/2 hours after starting the descent you'll arrive in the small town.